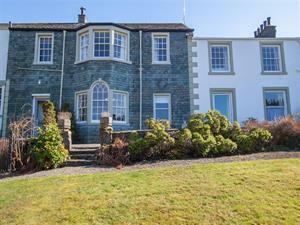 Grisedale View Self-cateringGrisedale View is a delightful property in an elevated position on the outskirts of Keswick, but still only a 15 minute walk to the nearest pub and three quarters of a mile down a leafy level footpath to Keswick centre and Leisure Pool. This spacious ground floor apartment is part of a Georgian Grade II listed property in which the poet Shelley lived in 1811. The property features in the early pioneering photographs of the Abraham brothers. It is comfortably furnished, with a hidden garden and summer house for those lazy days and afternoon teas gazing out at Grisedale Pike. There are fine and extensive views to the Thornthwaite fells, Skiddaw and Latrigg from most of the main windows. There is excellent walking in the surrounding hills and lake cruises on beautiful Derwentwater with a ferry for walking drop-offs and pick-ups, and valley rambles. Keswick boasts live theatre, cinema, museums excellent pubs, restaurants and shopping, a local produce market twice weekly and much more, making this an ideal destination for all seasons. Accommodation: Front door entrance into main hallway with space to hang coats, and doors to all reception rooms and bathroom. Comfortable sitting room with period feature fireplace, TV, DVD, free wi-fi and beautiful views from the Georgian bay window. Country style kitchen with granite worktops and quality units and adjacent dining room. Master bedroom with king-size bed (additional single put-you-up bed on request), and fine views to the fells. Family bathroom has period suite with bath and separate shower, basin and wc. Separate utility room. The apartment has a light and welcoming feel with large windows making the most of the open aspects from each room. Stylish and comfortable furnishings, fitted carpets in the bedroom and lounge, parquet and tiled flooring to hallway and other rooms, and tasteful decor with contemporary stone sculptures complete the internal details. Outside: Sunny West facing terrace with bench table and chairs over looking the gardens and fells. Further enclosed private garden and summerhouse with sofa and armchairs. Parking for one car immediately outside the front entrance. Pub half a mile and Keswick centre 1 mile. Note: Please note owners occasionally bring their cat to the property. Grisedale View is a delightful property in an elevated position on the outskirts of Keswick, but still only a 15 minute walk to the nearest pub and three quarters of a mile down a leafy level footpath to Keswick centre and Leisure Pool. 3/4 of a mile to leisure centre & town, theatre, cinema, museums, markets. Children welcome from any age. Grisedale View offers weekly bookings starting on Saturday.